Bernkastel-Kues (pop. 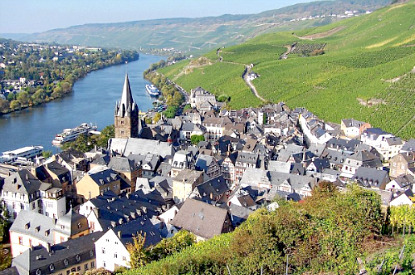 8,000) is a delightful little twin town in the Moselle Valley, halfway between Trier and Cochem. The first settlements date back to the time of the Linear Pottery culture, some 5000 years ago. The present town developed in the Middles Ages. Bernkastel was granted town status by King Rudolph of Habsburg in 1291. Bernkastel literally means "bear castle". In 1905, Bernkastel, on the right bank, was merged with the village of Kues, on the left bank. They were joined by the villages of Andel and Wehlen in 1970. Kues was the birthplace of Cardinal Nicholas of Cusa ("Nikolaus von Kues" in German, 1401-1464), a philosopher, jurist, mathematician, and astronomer, who is regarded as one of the greatest geniuses and polymaths of the 15th century. His works in science influenced such people as Nicolaus Copernicus, Galileo Galilei, Giordano Bruno, Johannes Kepler, or Gottfried Leibniz. He is buried in the chapel of St. Nikolaus-Hospital (Cusanusstift). The colourful medieval Market Square (Markt) is one of the most beautiful in the Moselle Valley. It is surrounded by many well preserved half-timbered houses, as well as the Renaissance Town Hall (Rathaus) built in 1608. The half-timbered Spitzhäuschen ("pointed house") on Karlsstrasse is probably the most famous building in town. Built in 1416, its ground floor is much narrower than the upper floors, which gives it a wobbly look. Other quaint houses of the like can be seen around Römerstrasse. The 14th-century St. Michael's Church (Pfarrkirche St Michael) has the particularity that its bell tower was once a defensive tower of the ramparts. 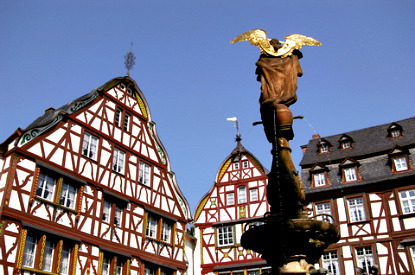 Bernkastel has many fountains, such as the St. Michaelsbrunnen (St. Michael's fountain) on the Market Square, the Bärenbrunnen (bear's fountain) and the Doctorbrunnen (doctor's fountain). Ruin of the 13th-century Castle of Landshut (Burgruine Landshut) overlook Bernkastel in the vineyards on the slopes of the valley. The castle was originally built 1277, but was accidentally ravaged by a fire in 1692. It offers one of the best viewpoint on the town and the river. From mid-April to October, you can ride the Burg Landshut-Express to the top if you do not feel like walking. Most of the sights here revolved around Nicholas of Cusa (see above). His birthplace has been well preserved over the centuries and is open to visitors. The nearby St. Nikolaus Hospital was founded by the famous cardinal. It houses a world-famous library with a collection of ancient books (only accessible by guided tours from April to October). You can also have a look at the cloister and inner courtyard of the hospice, as well as the Gothic chapel, where the heart of the great philosopher and scientist is entombed. Bernkastel-Kues lying at the heart of Germany's most renowned wine-making region, it is no suprise to find here the Moselle Wine Museum (Mosel-Weinmuseum). You can sample local wines at the Vinothek next door. Note that there is no train station in Bernkastel-Kues, so you will need a car to reach it, unless you want to walk the 10km along the Moselle from Ürzig (40min by local train from Trier). Coming by car from Trier, you can either follow the B53 road along the Moselle River, or take the E44 (A1) motorway until Wittlich (exit 125), then continue on the B50 road. The same applies coming from Koblenz. Just note that the B53 will be called B49, and the E44 might be indicated as A48, then A1.